–“An owned home is the most important asset in the portfolio of most households” [2, p.15]. –“Real estate, for either personal use or rental purposes, is the most highly valued asset owned by households.” [2, p. 18]. –“Homeownership is by far the single most important way families accumulate wealth.” [1, p. 3]. Thus, any analysis about the destruction of Black wealth has to focus on the historical (and present) barriers Black people have faced in owning property, and therefore in accumulating wealth. These barriers are structural, meaning that they have to do with the way society is structured. For Black people, barriers to homeownership are not as simple as having lower incomes or being poor. Thomas Shapiro  points out that wealth is intergenerational. Unlike an individual salary or income, which is used to support daily life, wealth is passed down from generation to generation. He defines transformative assets as unearned, inherited wealth that transforms a family’s position, making it possible for them to have certain life experiences beyond what would have been possible based on their own achievements, jobs, or income. For example, for many White families, inheritances, gifts, or loans for down payments (e.g., from parents) allows them to live a particular lifestyle, buy a home, or contribute to other needed resources such as a child’s college education. It goes without saying that for the first few centuries of U.S. history, Black people did not own property in large numbers. In fact, they were the property that Whites owned. Held as slaves, Black people were the building blocks of wealth for many White families. Fast forward past emancipation, sharecropping, the industrialization of the North, the first great migration of hundreds of thousands of Black people from the South to the North, and the ensuing race riots Whites initiated in reaction to the influx of Black neighbors. Taken together, by the early 1920s, segregation was becoming entrenched in northern cities, and White residents used a number of methods to ensure that Blacks would stay in Black neighborhoods. These included threats, harassment, offers to buy out black homeowners, and when these didn’t work, physical violence, cross burnings, and most dramatic, bombings. . Between 1917 and 1921 58 Black homes in Chicago were bombed; one Black man, a real estate agent, had his home bombed 5 times in one year . Realtors also played a critical role in maintaining the color line. They outright refused to show properties in White neighborhoods to Black buyers, or steered them to Black neighborhoods. Because Black households were restricted in where they could live, there was an enormous housing crunch, and demand for Black housing was extremely high. Therefore, White realtors also began to induce panic selling among White homeowners. They entered White neighborhoods, often times with Black families along, and scared White families into selling their homes before Black people entered the neighborhood. This tactic, called blockbusting, made money for realtors, who often divided up the newly bought house, and either rented it at high prices to Black individuals and families, or resold at high prices . By 1930, most cities had a well-defined Black ghetto. But within these borders, would-be Black homebuyers were blocked by banks and the federal government from buying homes. After the stock market crash in 1929, there were massive defaults on mortgages, people lost their life savings, and cities were not collecting taxes. In fact, in 1933, 50% of mortgages were in default . As a result, the HOLC (Home Owner’s Loan Corporation) was developed in 1933 to assist distressed homeowners with new financing and mortgages. The HOLC was authorized by Congress to take over and refinance delinquent mortgages, and also to create funding for new homes. Within only a few years, millions of applications were in. But, there was a catch, at least for Black homeowners or potential buyers. HOLC would not provide financing to everyone. Decisions were made based on characteristics of the individual and the neighborhood. Neighborhood characteristics included things like the demand, the % of current homeowners, and the age and type of building. The racial and ethnic characteristics were also paramount. HOLC developed a color coding to determine which neighborhoods were “good” and were not risky. The colors were green, blue, yellow and red. Green was the best, red was the worst. Neighborhoods that had anything more than a trivial amount of Black residents, had a racially mixed population, or did not have restricted covenants in place were coded red – hence the term redlining. Red neighborhoods were cut off from any government financing. 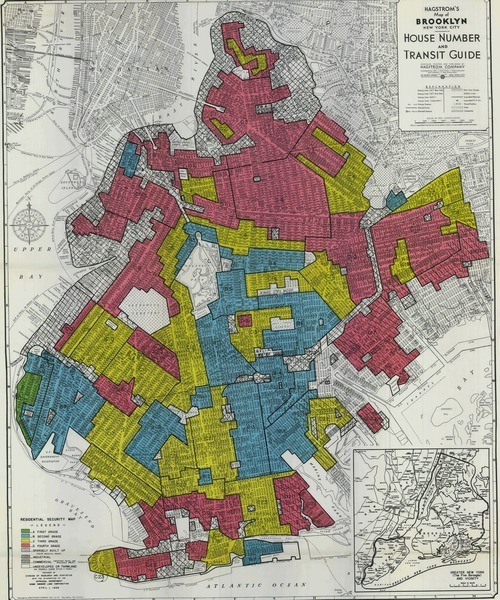 Below is an HOLC map of Brooklyn, made available by this site (which got the map from the National Archives): http://www.urbanoasis.org/projects/holc-fha/digital-holc-maps/ As can be seen, Black neighborhoods such as Bedford-Stuyvesant were entirely red. Private banks have also redlined Black neighborhoods for years. By using militarized language such as “invasion” and “infiltration” the FHA cast Black people as enemy combatants [4, p. 408]. The end result was that the “enemy” had extremely limited access to the federal funds that were fundamental in creating American suburbia, and that made White, middle and upper class neighborhoods the only areas that had value. Between 1940 and 1947, only 19 new FHA-backed housing developments were open to minorities, compared to the $33 billion of insurance that underwrote almost 3.5 million houses and 650,000 rentals and co-op units for Whites . And so, Black people were largely frozen out of home ownership. Whole cities had no access to FHA money. As late as 1966, Camden and Paterson, NJ had zero FHA-backed mortgages . Home values tripled from 1970 to 1980, so those who “owned homes before the late 1970s had an opportunity to accumulate wealth in the form of home equity, while those who did not missed an excellent opportunity” [5, p.108]. Black people by and large missed out, setting the stage for low wealth compared to Whites. And, for those who did own property, urban renewal (which razed many urban communities) created the loss of homes and businesses for many in Black communities. –A Black tester is told that they must meet with a mortgage lender before being shown homes. The White tester is shown 2 without. –A Black tester is shown a 1 BR apt and quoted rent of $675; the White tester (1 hr. later) is quoted $625. –A Black tester is politely shown a model apt in a complex, and given basic information. 15 minutes later a White tester is shown the model apartment, 3 actual apartments, and offered 1 month free rent on a 12 month lease. –A Black tester is steered to an FHA loan, despite good credit and enough money for a 10% down payment. The White tester is told that they can save $21,000 over 30 years with a conventional loan instead of an FHA loan. This last example is important because racial differences in loan terms and the foreclosures that result are the last step in destroying Black wealth. Black households have more of their net worth (59%) in home equity, compared to other assets. Thus, when the economic downturn and bursting of the housing bubble hit, they were hit hard. In fact, the bursting of the housing bubble deflated Black wealth by 53%, compared to 16% for Whites. . Inequalities in other areas, such as employment, meant that these households also had to take on more debt to get by . Less assets and more debt=less wealth. Overall, between 2001 and 2011, for Black households, "the first half of the decade brought little, if any growth, while the second half of the decade resulted in devastatingly large losses” and gains that occurred in closing the wealth gap in the 90s were reversed [10, p. 1]. But how did Black households become entangled in the housing bubble? After years of being denied access to mortgage loans and related financing, some lenders became very interested in making funds available to Black homeseekers. With traditional lenders staying away from urban markets, and with the rise of mortgage-backed securities being traded as investments, predatory lenders and subprime lenders had a ready market . Wall Street wanted more and more mortgages to use as securities, which meant more and more mortgages needed to be given to people–the higher the risk, the better. And, since Black borrowers often could not obtain conventional mortgages, predatory lenders were ready to give loans at very high rates. Subprime mortgage loans are those that are 3% or higher than the rate for a standard long-term Treasury bond. On a $350,000 mortgage, a subprime loan adds on $272,000 more in interest over 30 years, compared to a mortgage of the same amount with a conventional loan . Subprime loans also tend to have more penalties, higher fees, and adjustable interest rates, which means monthly payments could change every so often, usually becoming much more expensive. Black people and neighborhoods were targeted for these loans. According to a HUD study in 2002, subprime lenders are 5 times more visible in Black compared to White neighborhoods . The NAACP has filed a class-action lawsuit against major lenders, arguing that this targeting constitutes reverse redlining . But subprime lenders did not target Black borrowers simply because they have lower incomes. The Black middle class has actually been the hardest hit. Black households earning $68,000 or more were 5 times more likely to have a subprime loan than White counterparts, and even White borrowers who earn less . According to The New York Times, among borrowers earning $150,000-$250,000, 20% of Whites, but 62% of Blacks held subprime loans. New York City’s Department of Housing Preservation also found that 58.5% of home loans to Blacks were high cost, compared to 15% for Whites . Black neighborhoods, in addition to individuals, also have higher rates of subprime lending. For example, in 2006, in Jamaica, where the median household income was $45,000, the subprime rate was 46%. In Bay Ridge, with an income of $50,000, it was 3.6% . In 2001, Bedford-Stuyvesant had a rate of 14.3%, compared to Park Slope at 3%. Queens Village was 9.8%, compared to Bayside at 3.5% . These disparities led Sarah Ludwig, executive director of the Advocacy Project, to state that “There’s no question that if you live in a predominantly African American and Latino neighborhood, you’re going to be paying more for your mortgage.” . It is not surprising, then, that Black and Latino neighborhoods have the highest rates of foreclosure. In addition to the high costs of subprime loans, other issues such as job and income loss and sickness also hamper people’s ability to pay their mortgages on time, and Black and Latino people have higher rates of unemployment and illness. In New York City, the Community Districts with the highest foreclosure rates are Brownsville, Bed-Stuy and East New York, all Black and Latino neighborhoods. In fact, than 50% of properties that were taken by the lender were in less than 9% of Community Districts . In other words, foreclosures are highly concentrated in only a few areas, and those areas are marked by the color line. When a house is foreclosed, the homeowner loses a major source of wealth, and damage to their credit rating then makes other financial opportunities less likely. That loss of wealth is transmitted intergenerationally, and means that it will persist over time. And, foreclosures damage communities. For example, 3 foreclosures within 500 feet lowers the sale price of a property by 3% . Thus, both individual and community wealth are destroyed. And, research has shown that expanded lending to minority homeowners through the Community Reinvestment Act is not related to foreclosure rates–but racial segregation is . –“Isn’t the "oppression” of white folks responsible for all of the ills that plague minority communities? How long before Al Sharpton and Jessie Jackson demand that those who made smart decisions bail out these people? Obama is already giving money to these minorities who bought houses they didn’t deserve. They should move to public housing (aka the projects/the ‘hood) where they will better fit in, and will feel more comfortable, and be able to save more money. Shapiro, T.M. (2005). The Hidden Cost of Being African American: How Wealth Perpetuates Inequality. New York: Oxford University Press. Pew Research Center (2011). Wealth gaps rise to record highs between Whites, Blacks, and Hispanics. Massey, D. S., & Denton, N. A. (1993). American Apartheid: Segregation and the Making of the Underclass. Cambridge: Harvard University Press. Kimble, J. (2007). Insuring inequality: The role of the Federal Housing Administration in the urban ghettoization of African Americans. Law & Social Inquiry, 32(2), 399-434. Oliver, M.L., & Shapiro, T.M. (1997). Black Wealth/White Wealth: A New Perspective on Racial Inequality. New York: Routledge. Galster, G., & Godfrey, E. (2005). By words and deeds: Racial steering by real estate agents in the U.S. in 2000. Journal of the American Planning Association, 71(3), 251-268. National Fair Housing Alliance. (2006). Housing Segregation Background Report: Brooklyn, New York. Roscigno, V. J., Karafin, D. L., & Tester, G. (2009). The Complexities and Processes of Racial Housing Discrimination. Social Problems, 56(1), 49-69. Squires, G. D., Friedman, S., & Saidat, C. E. (2002). Experiencing Residential Segregation: A Contemporary Study of Washington, D.C. Urban Affairs Review, 38(2), 155-183. Rosenbaum, E. (2012). Homeownership’s wild ride, 2001-2011. US 2010 Project. Phillips, S. (2010). The Subprime Crisis and African Americans. Review of Black Political Economy, 37, 223- 229. Powell, M., & Roberts, J. (2009, May 16). Minorities Affected Most as New York Foreclosures Rise, The New York Times. Fernandez, M. (2007, October 15). Study finds disparities in mortgages by race. The New York Times. Furman Center for Real Estate and Urban Policy, NYU. (2004). State of New York City’s Housing and Neighborhods. Furman Center for Real Estate and Urban Policy, NYU. (2010). State of New York City’s Housing and Neighborhods. Weselcouch, M. (2012). Foreclosure crisis in New York City: Cause and consequences. Presentation at American Planning Association, New York Metro Chapter (Furman Center, NYU). Rugh, J. S., & Massey, D. S. (2010). Racial Segregation and the American Foreclosure Crisis. American Sociological Review, 75(5), 629-651.